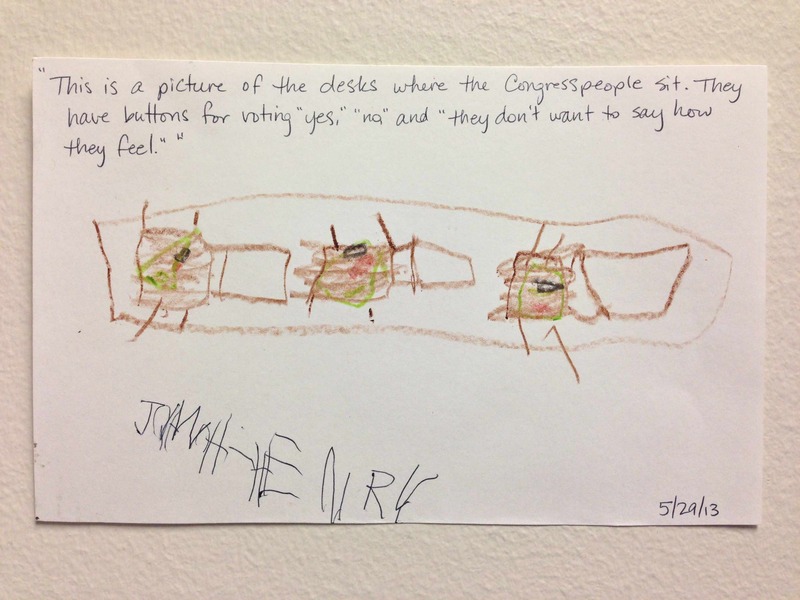 "They don't want to say how they feel"
During the last week of the legislative session, a kindergartener named John-Henry came by the Capitol for a visit. John-Henry got a look at many of the always-beautiful, occasionally functional features of this building – the Rotunda, the Senate and House chambers, etc. Part of his visit was to my office (located in Room E1.606 in the Capitol’s underground exurbs north of the dome; be sure to swing by if you find yourself tunneling to Round Rock). I guess he had a pretty good time, because he sent a very nice letter to my office a couple of weeks ago. It included a drawing of one of the Capitol’s less-obvious attractions: one of the voting panels on the representatives’ desks in the House Chamber. For the uninitiated, the third button actually registers a legislator as “present-not-voting.” If that seems technical and legalistic, it’s only because “I don’t want to say how I feel” is a little too accurate. Of course, the Senate doesn’t use buttons at all. We just hold up fingers for the Secretary of the Senate to see what our votes are (one for “yes”, two for “no,” and three for “present-not-voting”). There’s not even a board like the one in the House with lights (lit up by those buttons on the desks) to show what each representative’s vote is. In other words, we’ve sort of perfected the art of not letting people know how we feel. The “special” session continues to drag on. Yesterday was the deadline for submitting alternative redistricting plans in the Senate. I filed one that would remedy the legal and constitutional problems with the legislative plan in Central and South Texas. It would restore the “crossover” district that those in control of the legislature are wrongly trying to destroy in Travis County and maintain the number of Hispanic “opportunity” districts. It’s a common-sense proposal that shows the state doesn’t have to choose between the Constitution and the Voting Rights Act when drawing up a redistricting plan. Over the summer, assuming I’m not updating you on a pointless special session designed to prop up the state’s legally dubious effort to disenfranchise minority voters, I’ll be providing more details about actions the legislature’s taken in the last five months that will affect Texans over the next year and a half (when we’ll next meet for a regular legislative session) and beyond. At least some of those actions may be undone over the next week, as the Governor hits the constitution’s deadline for vetoing legislation (look for a summary of what he whacks next week). So there’s still some risk of counting chickens before they hatch. But there was no issue more important this session than funding for our schools and school kids. And I want to take this opportunity to update you on what we accomplished and what we still need to do. Last session, those in control of the Capitol cut $5.4 billion from public schools. That puts Texas 49th in the country for per pupil spending – approximately $66,000 less per elementary classroom than the national average. More than half of the school districts in Texas have sued the state over its inequitable, inadequate funding system. In January, a district judge in Austin ruled in favor of the districts, saying the state’s school funding system is unconstitutional. This Legislature restored $3.9 billion to public schools – putting money back into essential programs like tutoring for at-risk students, Communities in Schools, and Teach for America. Of that, $3.4 billion will go directly to students and classrooms. It’s not enough – not by a long shot – but it does go a long way toward reducing the impact of the 2011 cuts, and it’s a drastic improvement over the early drafts of this budget. This year, the legislature also voided a complicated but important mathematical gimmick that was used to cut school funds last session. This was the number one objective of the Equity Center going into this session. We also added $30 million to full-day pre-K programs. This is an improvement from last session, but it’s obviously not enough – especially when we all know how important Pre-K is to a child’s future development. Pre-K is one of the best investments the state can make in its future, and there’s no question that Texas can do better. All in all, I’m proud that the the legislature restored much of the funding that was cut in 2011. But Texas still can and must do better for our kids, our schools, and our future, and we’ll be working hard through this interim and into the 2015 session to make sure that Texas does do better.